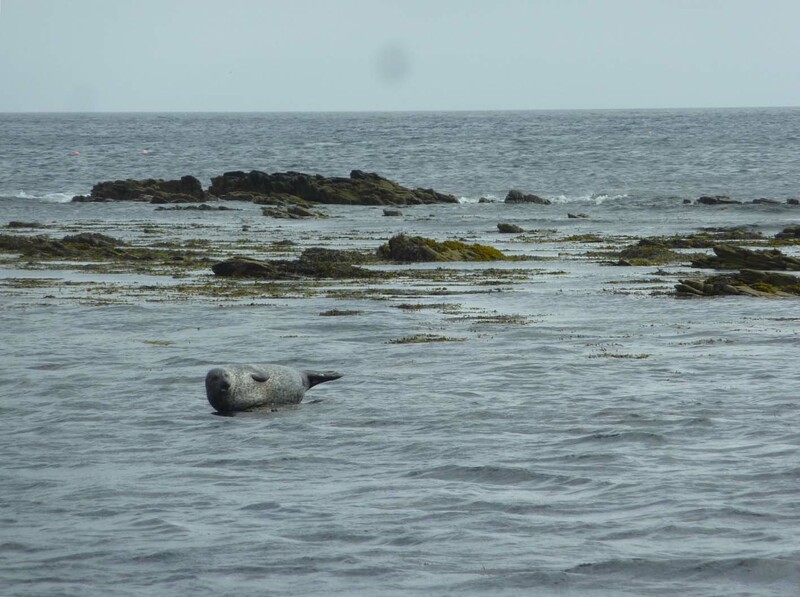 We had a pleasant trip from Aberdeen to Shetland. Excellent dinner and breakfast, a calm sea and a good night’s sleep in our cabin. 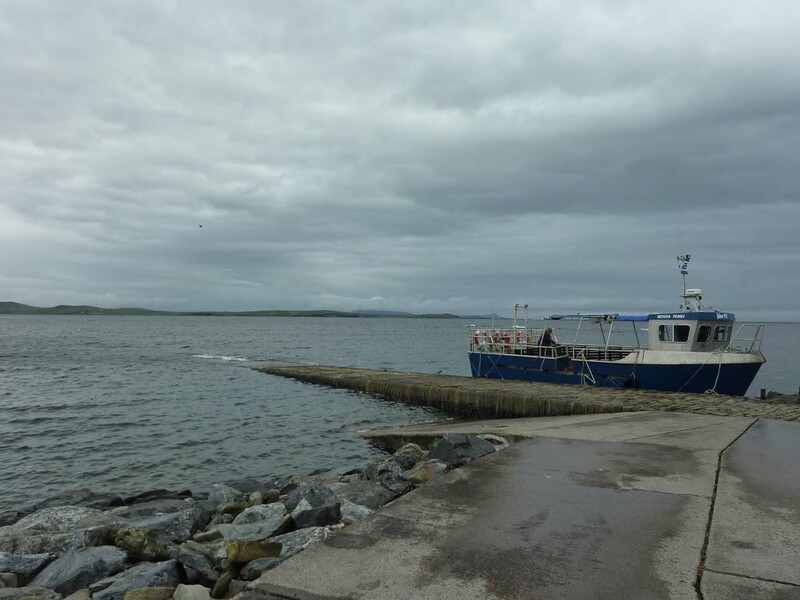 Unfortunately the weather had let us down and we arrived in Lerwick in a dull drizzle. 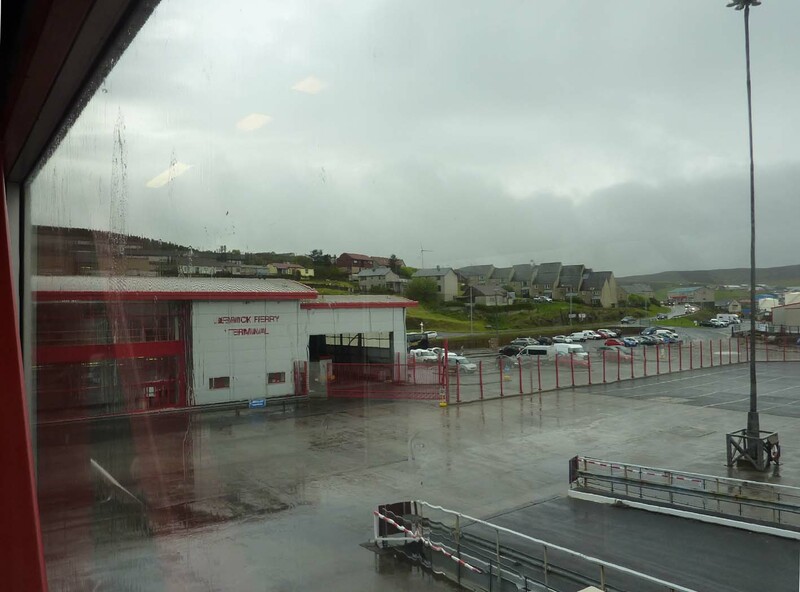 Landing in Lerwick ferry terminal – rain streaked windows. Luckily it had stopped by the time we got on the coach and headed south and on to another ferry. This one was a bit smaller and the trip shorter; across to the island of Mousa. 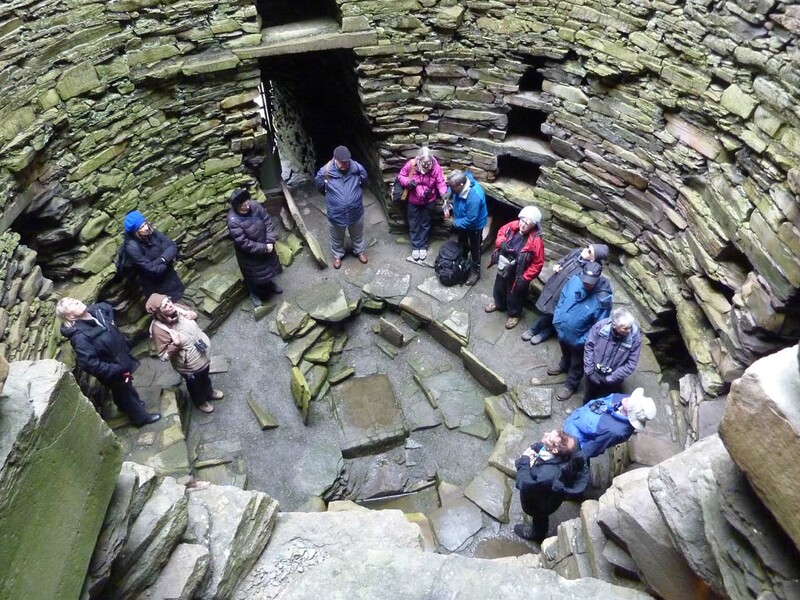 We were to visit the iron-age broch that sat on the edge of the island. There was the remains on the mainland opposite, but the one on Mousa was almost complete; so complete that most of the interior survives and you can climb the (very narrow) stairs to the top. 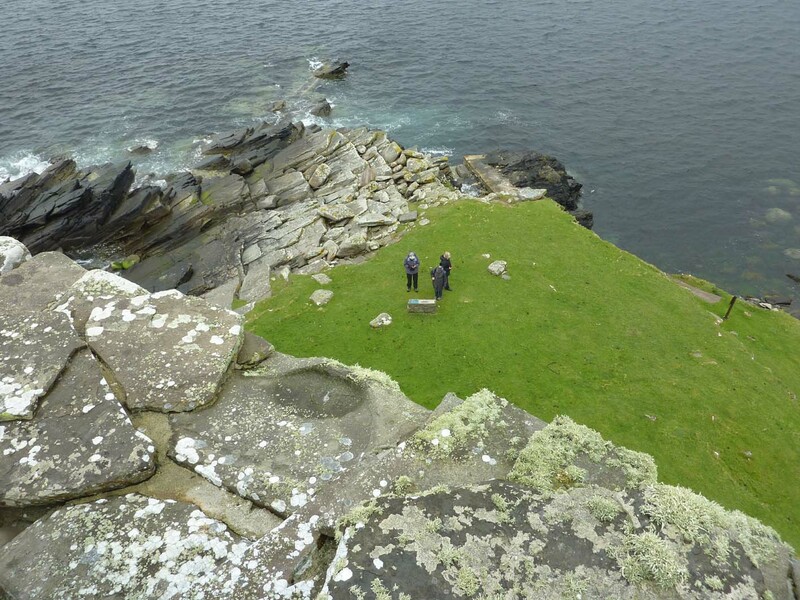 Top of the Broch. Why do you need a torch? To see the stairs of course! As we made our way back to the ferry, the sun came out and things looked more cheerful. Seal on a rock, watching the passing boat load of tourists. Lunch with added wireless equipment at Hoswick. 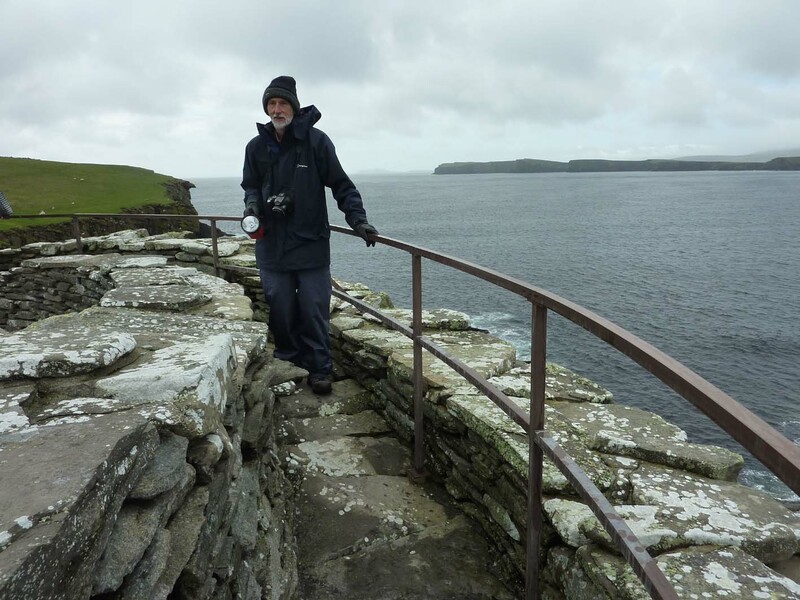 Once we had dragged him back to the coach, we travelled further south, via Old Scatness, which wasn’t open, to the southern tip of the Shetlands, Sumburgh Head. We were there, not for archaeology (or radio stations) but birds. We were promised puffins, they did not co-operate, we saw none. There were other birds, flying to and from dramatic cliffs, and the sun was shining. 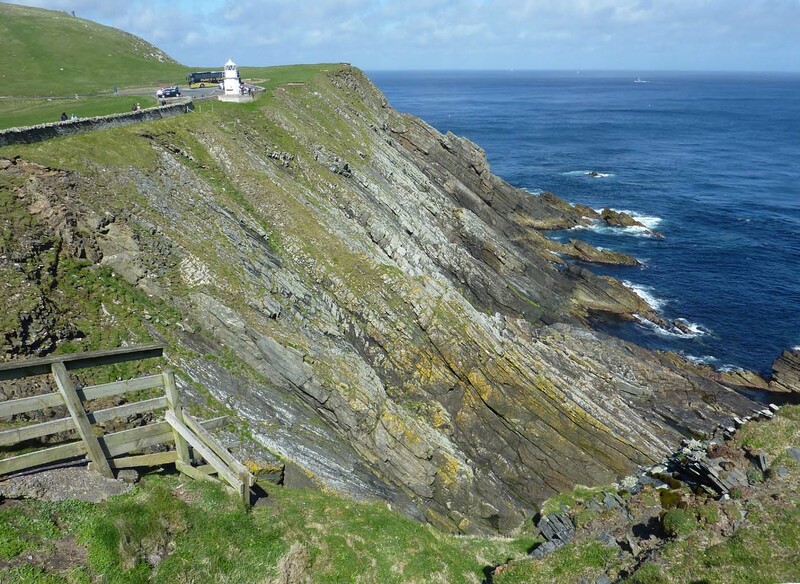 Cliffs at Sumburgh Head – our coach beside the lighthouse. Twitchers looking for non-existent Puffins. 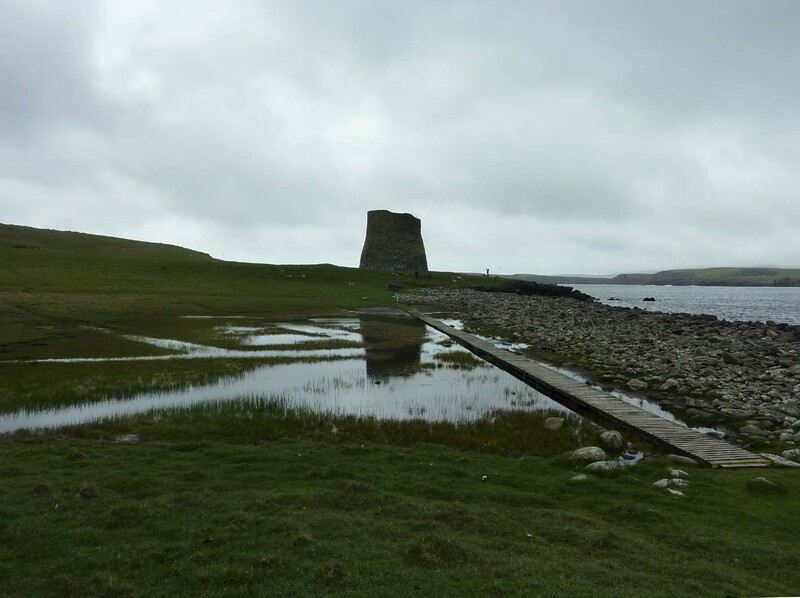 We drove the short distance to Sumburgh Hotel for tea and biscuits and then walked to the nearby site of Jarlshof. For me this was the highlight of the trip. I had never heard of this site before, but it has everything; 4,500 years of settlement, on one site, all excavated and laid out in chronological order. You start with the remains of huts dating from 2500 BC or earlier. There is not much left as the inhabitants must have reused a lot of the materials. Beside them is a Bronze Age smithy (800 BC) and older houses. Next is an Iron Age village, from the final centuries BC. 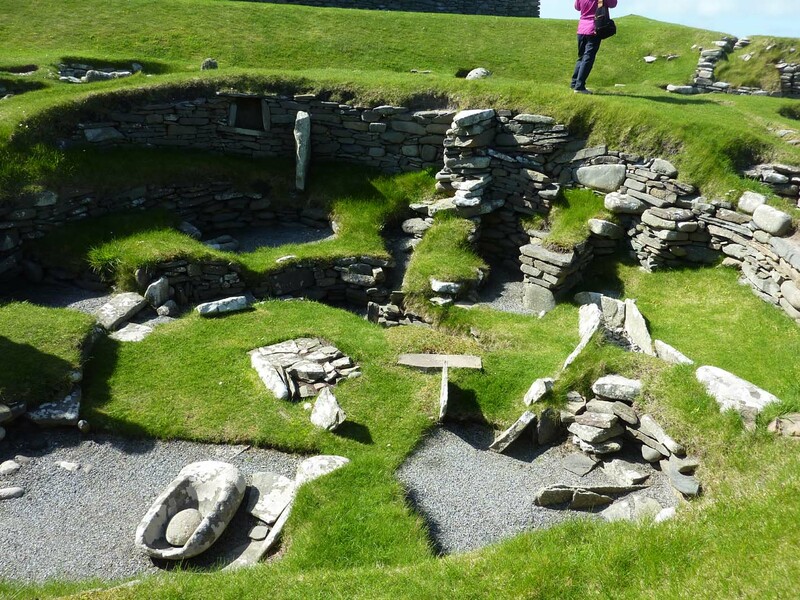 The sea has taken part of a Broch and its courtyard, also Iron Age. Tucked next to them are wheelhouses from the second and third centuries AD. 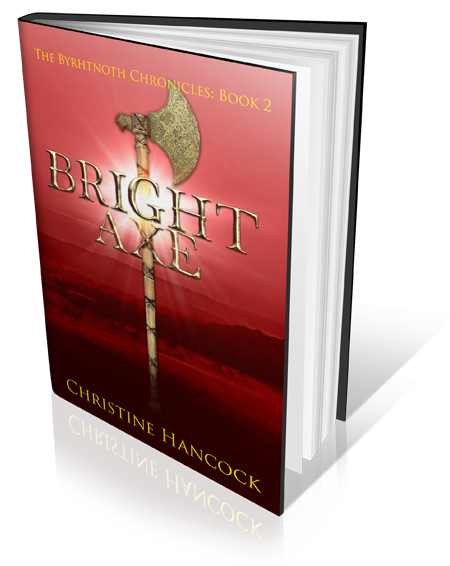 Behind these earlier settlements are the Norse longhouses dating from the 800s and continuing over 400 years. Nearby are the remains of the Medieval farm that followed. Towering over the site is the New Hall, built in the 1580s by Earl Robert, Lord of Shetland and expanded by his son Earl Patrick (we will be meeting him later.) Within a century this building was in ruins, but in 1867 a new Laird’s House was built. 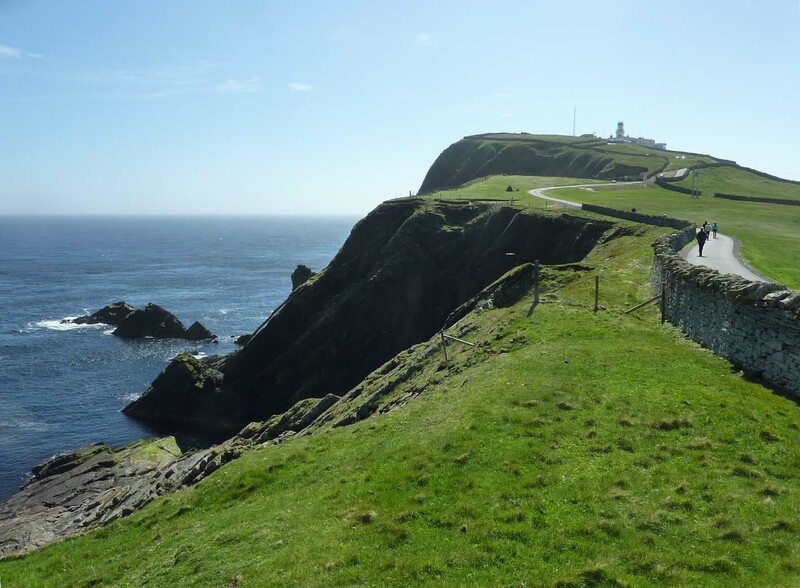 This is now the Sumburgh Hotel, where we started this visit. 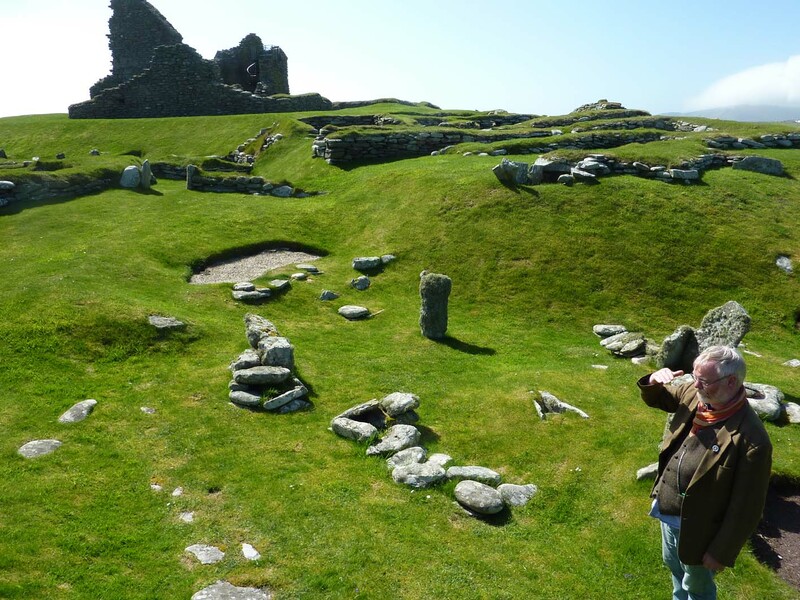 It is a wonderful site to visit, but best take a knowledgeable archaeologist with you! 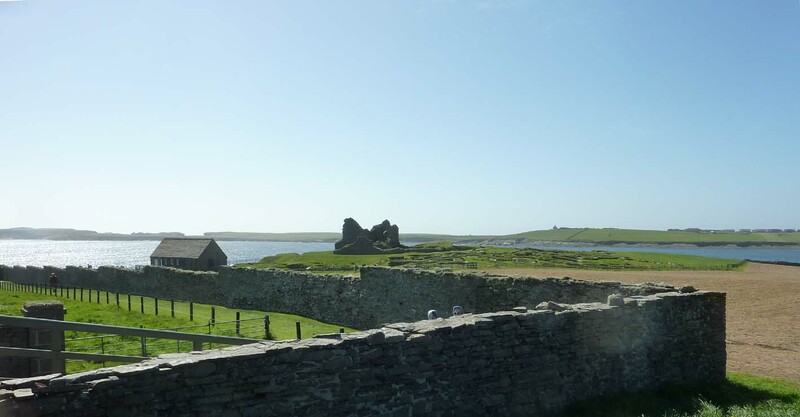 Jarlshof, The site from Sumburgh Hotel. Archaeologist Alan Braby in the Stone Age. Looking into the future? Looking into one of the houses. Think this is Iron Age. There were saddle querns all over the site. Alan in a Norse house, pointing out the length? 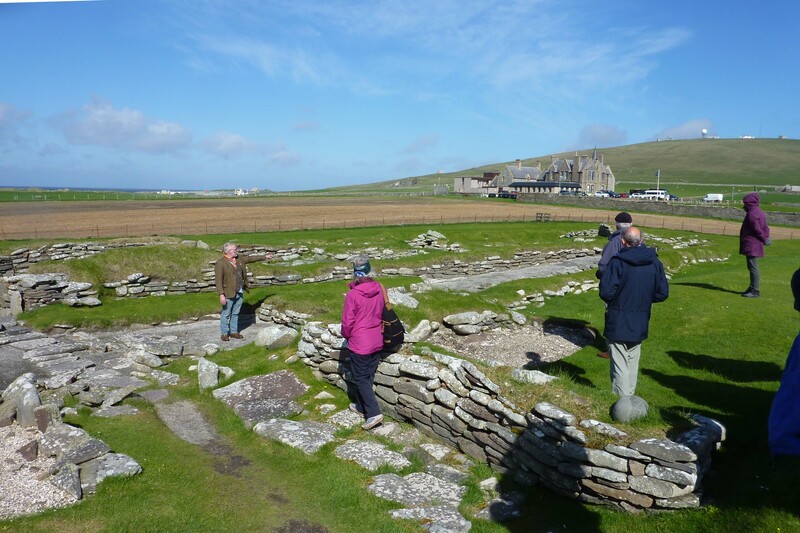 or towards the medieval farm, or Sumburgh Hotel? 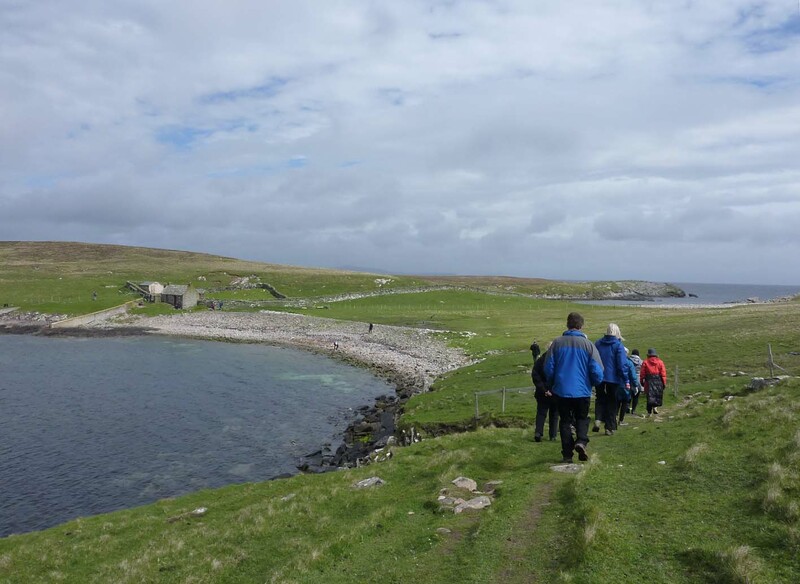 After this we left, tired and sunburned, to return to Lerwick and to check into our hotel. 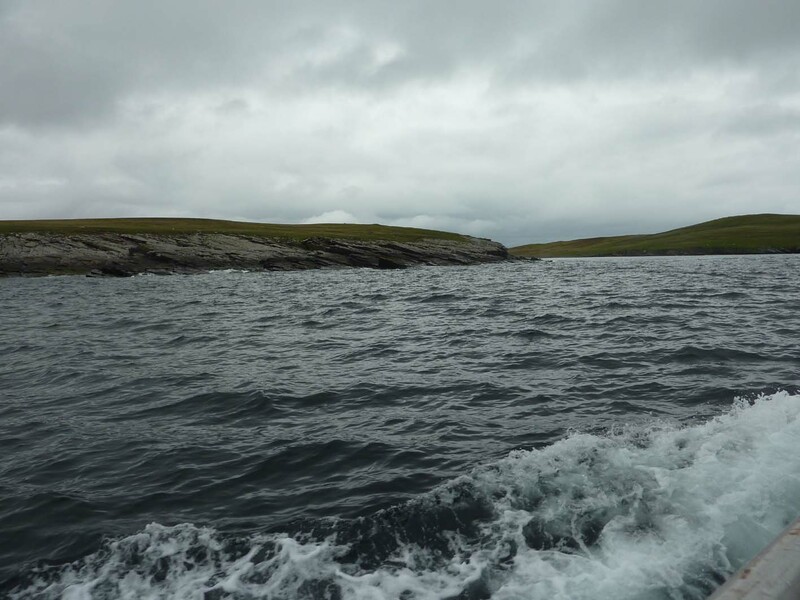 I was hoping to cover all of our stay in Shetland in one post, but we did so much (this covers just one day!) that I will have to leave that to the next post. 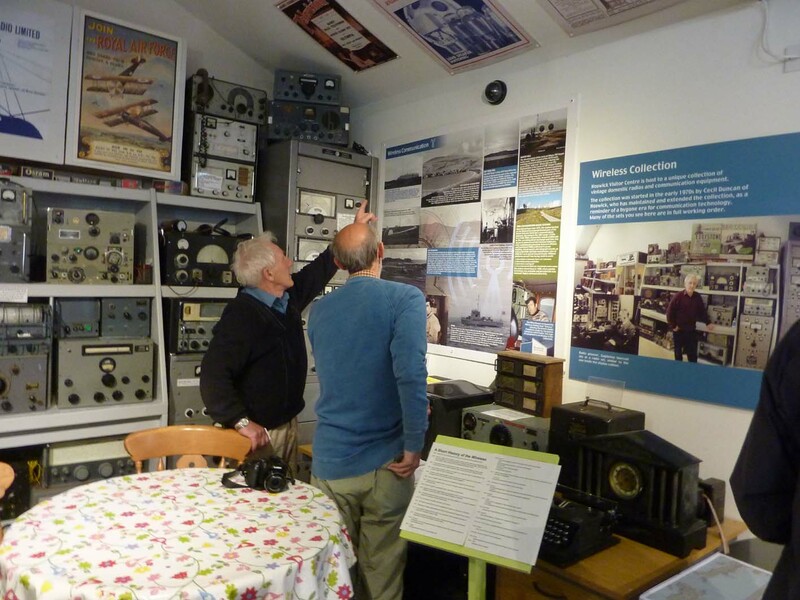 I am very glad you liked your visit to Shetland, it was my wireless collection you saw in the Hoswick Visitor Centre. Sadly the display in the corner with the history of the various radio stations etc. in Shetland has now been removed. What a shame. It was the highlight of the holiday for my husband – much better than the Wireless Museum in Orkney. I suppose it is rather a minority interest, but do you have plans to display it elsewhere?